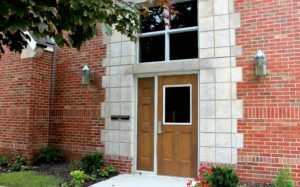 Allen Park Presbyterian – Sidock Group Inc. This project involved placing a new elevator and shaft within an existing historic community building. To accomplish the new elevator, a grade level entry and lobby was created between existing floor levels. Also included is a new barrier-free toilet room and new finishes throughout the work area.